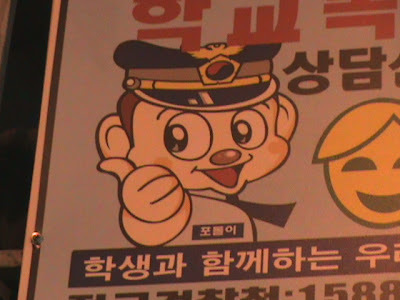 I thought I'd share the mascot for the Korean National Police Agency, Podori, with you. Isn't he cute? 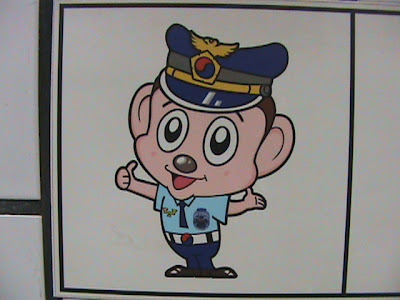 In case you didn't know, combining such cute characters with not so cute organizations, like the police department, softens that organizations image. Who would you rather have boss you around, a gruff looking police officer or little Podori? But don't be mistaken, Podori is the real deal. If you look closely you'll notice that his badge is not a mere drawing but a real badge! I think there may be a problem with having Podori as a mascot. 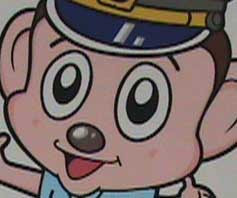 He may be too cute a character for the police department. It almost makes me want to commit a small crime just so I can see him. Then maybe I can give him a choco pie and he'll let me off the hook. Then we can go get pizza or something and we'll become close buds. Then we'll team up and become a crime fighting team! 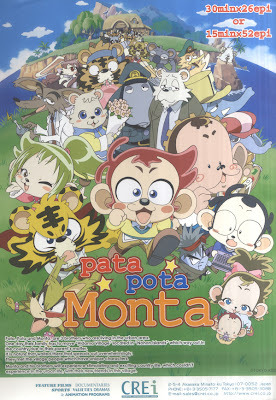 I also noticed that Podori's design seems awfully similar to this character in Pata Pota Monta, a Japanese production. Maybe they are cousins? I prefer Podori, though. Especially in the first image. I particularly like the way his eyes are drawn. So is Podori a monkey? What does that imply about the police...? No, Podori is supposed to be a human, but he does look a lot like that monkey animation though, doesn't he?